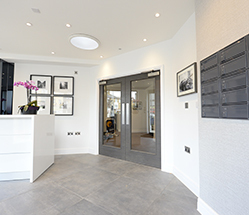 A project driven primarily by design, Dorplan manufactured and supplied over 200 bespoke doorsets in extremely aesthetic finishes. 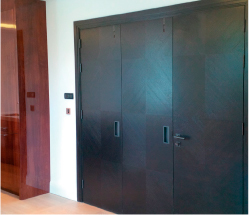 The doors were veneered in diagonal stitching designs and the full doorsets were stained in ebony. 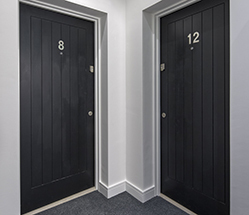 Door types ranged from double security PAS24 type apartment entrance doors through to oversized sliding pocket door systems. 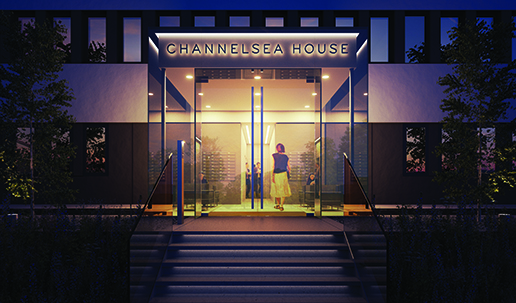 We contributed heavily on the design and technical aspects of this project, giving our expert advice to ensure the client’s needs were fully met. A desirable open plan layout comprises the kitchen, dining and living space, offering a multi-purpose family and entertaining space. The interiors are fresh and modern, with both sleek and functional design details. 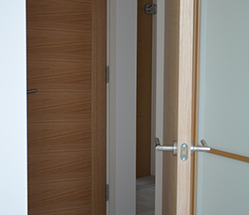 The use of Dorplan oak doorsets brings a atmosphere of warmth to contemporary living spaces. 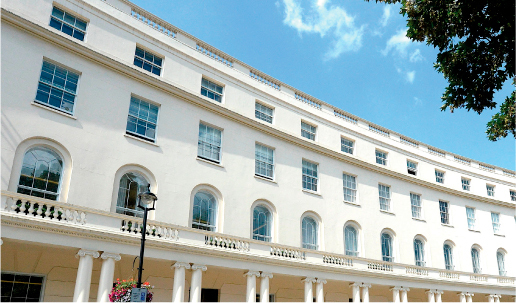 The apartments at Mulberry House have been designed with today’s busy professionals in mind. With furnishings by Habitat Interiors, the look is chic, sleek but comfortable. 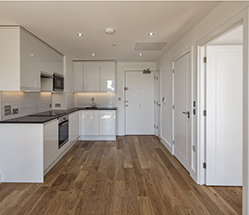 Each apartment also features state-of-the-art technology and appliances. 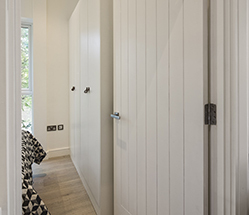 Dorplan’s grooved feature doors in factory finished paint are complimented with the stunning satin chrome hardware, really taking a grip on the design. 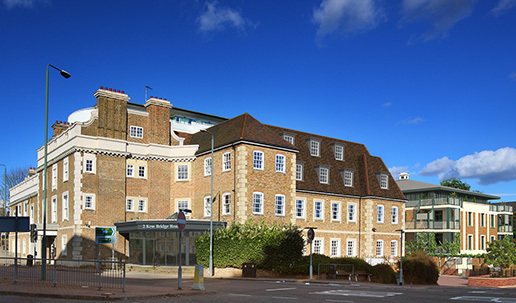 Sutton Court Road. 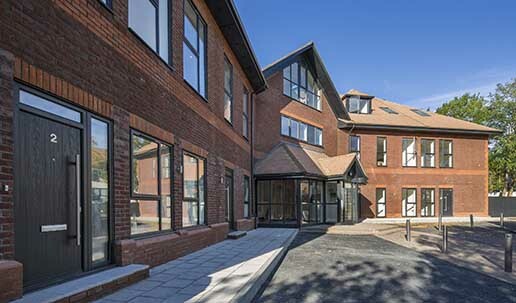 A 4,000 m2 residential development of high-quality compact living apartments in Sutton, Surrey. 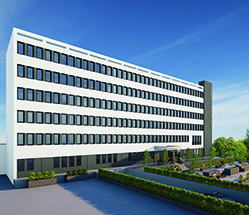 Conversion and extension of an existing, 10 storey office building providing 73, one and two bed apartments. 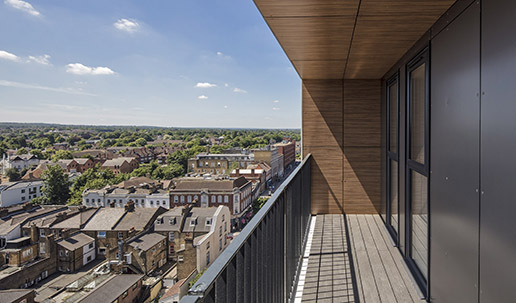 Twelve Architects were appointed to design an additional nine penthouse apartments on top of the existing building and remodel the external façade to include new balconies, upgrading of the thermal envelope and the design of amenity space to the front of the site. 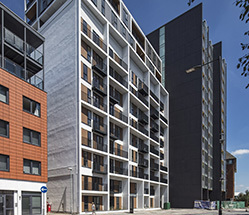 The sought after Dorplan factory pre-hung security entrance and internal doorsets were provided throughout the development. 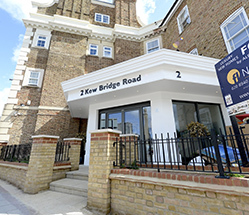 2 Kew Bridge is an impressive collection of thirty-five high specification apartments in one of London’s most desirable locations. The classic Georgian architectural features of the exterior are reflected in subtle ways within the interior design style. Some classic influences are retained, for instance, in the architraves, skirting and other details. 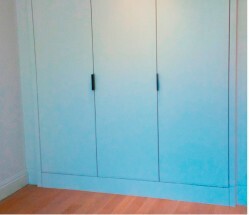 A great view doesn’t come cheap, but there again, Dorplan’s feature doors don’t deserve anything less.